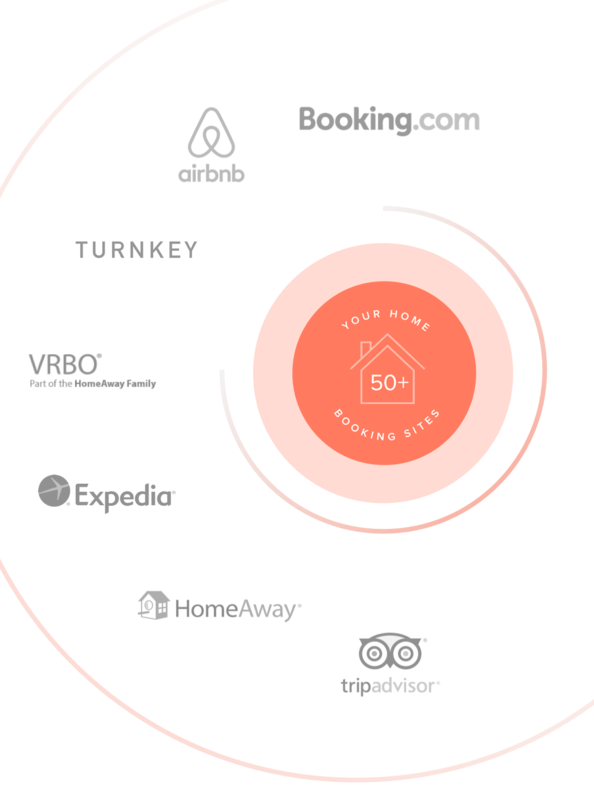 We'll expand your marketing reach by crafting and managing your listing across 50+ well-known vacation rental sites (e.g., Expedia, Homeaway, VRBO, Airbnb, etc. ), and regularly promoting your rental to our database of 100K+ travelers. Plus, you'll earn more with our proprietary pricing algorithm designed to maximize bookings coupled with proprietary technologies that will reduce operational costs. You'll also keep more revenue since our business model allows for us to charge around half of our competitors' commission rates. Whether you're trying to DIY or working with a no-name property manager, our 24/7 local teams will give you complete peace of mind. We'll work tirelessly to keep you compliant with any tax, license, and regulation changes for your area. Your home will always be guest-ready since we'll perform rigorous inspections at a regular cadence, manage our local vendors and housekeeping staff, and install our proprietary technologies (including digital locks, noise monitors, Wi-Fi routers, and HomeDroid tablets) to keep your property safe. You won't have to lift a finger since our local teams and technologies will not only market and maintain your rental, they'll handle the entire guest experience. You'll be able to kick-back and relax while we manage all guest communications, complete in-depth background checks, offer tailored itinerary suggestions, answer questions 24/7, manage property damages (only 3 out of 1,000 TurnKey checkouts see damages), and even make house calls. You, and your guests, will be impressed with our quality of service - every time. Through our unique business model, we're able to provide additional services, local expertise, and proprietary technologies while still undercutting the competition. You'll keep more revenue with a commission rate typically around half the industry average. Our internal listing experts will hand select and edit every photo and craft your vacation rental listing to boost your search engine rank and make it irresistible to potential guests. We'll tailor your listing across 50+ well-known vacation rental sites (e.g., HomeAway, VRBO, Airbnb, etc. ), implement PPC campaigns, and regularly share your rental with our database of 100K+ travelers across a variety of marketing channels. Our Revenue team monitors the success of each and every vacation rental across multiple listing sites. They'll leverage our proprietary pricing algorithm to best meet market demand maximize bookings all year long, not just your peak season. Our Reservation Team will answer every guest inquiry within 5 minutes or less and work to turn rental inquiries into reservations. This tactic has helped make TurnKey the top property manager on HomeAway by closing 40% more bookings than our competition. Our 24/7 local team will install our proprietary technologies (including digital locks, noise monitors, Wi-Fi routers, and HomeDroid tablet) in your home at no additional charge. We'll also make sure you remain compliant with any tax, license, and regulation changes specific to your property's location. You'll be encouraged to leverage your dedicated Account Management team and mobile app to contact us, adjust your listing, view your dashboard, ask questions, and communicate with guests anytime, anywhere. On average, our proactive tactics and diligence result in less than 1% of checkouts resulting in any kind of property damage. However, if something does happen, our industry-leading Property Damage Protection will make sure you're fully covered. Our local teams will be available to you and your guests at all times. They are ready and waiting to to answer questions, address issues, and make house calls whenever it's needed. To ensure the best guest and homeowner experience, we manage every entrance to your property with our proprietary digital lock. Plus, our HomeDroid tablet will coordinate local teams, a Ring Video Doorbell will record anyone who approaches your door, and monitoring systems will keep your guests and rental property safe. Due to our proactive tactics and proprietary technologies, only 3 out of every 1,000 checkouts experience material damages. Your property's calendar will always be up-to-date and available for instant booking across each of our 50+ listing sites. We'll also conduct a thorough guest screening via IDology for all guests to help ensure your property is treated with respect. ​Your property will always be ready to welcome guests. Our thorough checklist and photo comparison process will ensure your property is hotel-grade clean, fully stocked, and every item is exactly where you want it — every time. 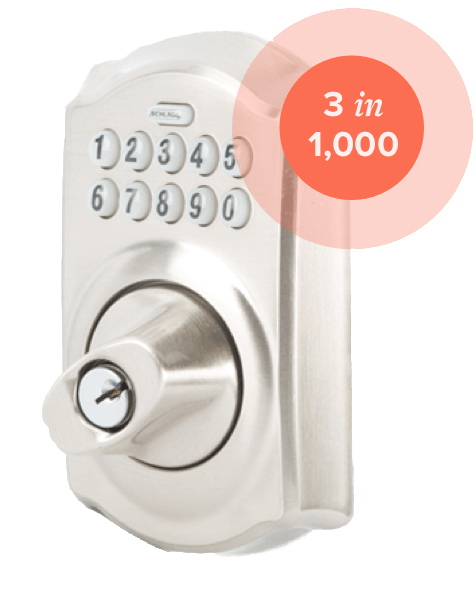 Our proprietary digital lock means you'll never have to endure an awkward or inconvenient key exchange again. We'll generate and send a custom code to your guest along with helpful and informative communications from the moment your guest books your rental and beyond. Guests will be able to make the most of their stay with our HomeDroid Concierge App that provides local entertainment and restaurant suggestions, as well as specific information about your home including Wi-Fi access, TV instructions, and more. Not only will we provide welcoming and informative communications from booking to check-out, but we'll encourage your guests to leave a review so we can continuously improve how we market your rental on your behalf. 99% of Our Guests Give Housekeeping a Rating of 4 or 5 stars. Your property will always be ready to welcome guests. Our thorough checklist and photo comparision process ensure your property is hotel-grade clean, fully stocked, and every item is exactly where you want it after every stay. "TurnKey was amazing. It was easy to get in the property and it was right on the beach, as advertised. Clean sheets and a relaxing, worry-free stay. Thanks!!" Feel free to reach out even if you don't see your location listed as we're continuously looking to expand our reach.